This accompaniment began in 1948, when I arrived in Rome as a young aspirant to the Congregation and found Prima Maestra waiting to welcome me with a big hug and smile. I lived in our huge Via Antonino Pio community during the years in which Prima Maestra was always among us: in chapel, for meals, during kitchen cleanup… after which we all would scatter to various parts of the house to carry out the activities assigned to us (household duties, work in the garden, typography, bindery, classes and study for the students, etc.). 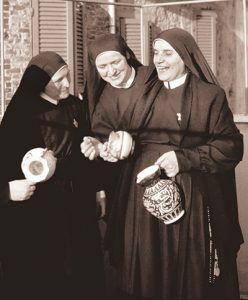 As for Prima Maestra, with hands humbly clasped in front of her, she would say with a smile, “Now I have to carry out the role of Superior General.” With those simple words, she would go to her office and spend her day talking with and listening to the sisters who knocked on her door for many different needs, both big and small. She would also dedicate time to answering letters from our overseas communities, which gave broad scope her missionary heart. I lived for many years in the same community as Prima Maestra Thecla. It was impossible to remain unaware of her presence, which was characterized by goodness, dignified behavior, hard work and a focus on essentials. She irradiated faith, trust and serenity of life. It was not difficult to run into her here and there, greet her and walk alongside her without any bashfulness or awe. Prima Maestra was one of us and not just because of the way she dressed! To kneel beside her in chapel and to share recreations with her was something perfectly normal–an everyday affair. This woman, whom today we still feel close to us, was humble and poor. It is to her that I owe my spirituality, cultural development and mission. I remember how she said a firm no to my grandfather, who came to Rome for my vestition. He was 90 years old at the time and he said he wanted to take me home with him, assuring Prima Maestra that he would then bring me back to Rome. But she looked him in the eye and said a firm no, perhaps doubting that he would really let me return. I remember the many wise things she said in her talks to the Rome community. These conferences took place once a week in our big community room, which was adorned with a huge banner bearing the words “One in heart and soul.” What Prima Maestra had to say to us was always clear and focused on essentials. 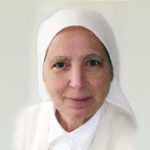 A woman who was truly “associated to priestly zeal,” she was a great example to us of prayer and union with God. She often would say: “By myself I can do nothing, but with God I can do all things,” paraphrasing in a simple and accessible way the words of St. Paul to the Philippians: “I can do all things through him who strengthens me” (Phil. 4:13). To list in detail all my small encounters with Prima Maestra Thecla over the years would be to risk reducing them to banality, so I will mention only three of these occasions that stand out in a special way in my mind: her presence at my religious vestition on 25 January 1950; her figure kneeling at my side when I made my profession on 19 March 1953, and the last smile she gave me before her death on 5 February 1964. That smile, which I perceived as a maternal blessing, is always with me.